Continuing my series of posts covering Io resources online, today we look at raw images of Io. 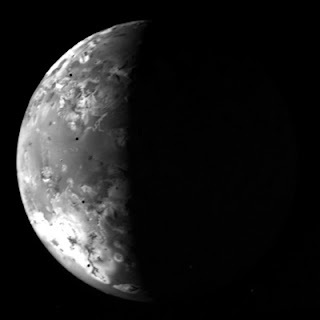 The images you see online of Io are processed from raw images acquired by various NASA spacecraft, including the two Voyagers, Galileo, Cassini, and New Horizons. For the time being, I am excluding Pioneer 11 and Hubble from this discussion, but I may come back to those at a future date. All the images acquired by those five spacecraft of Io are available online for you to process into your own masterpieces. Today, I'd like to show you where and how to acquire these images. Raw images from NASA spacecraft are available from the various nodes of the Planetary Data System or PDS. The PDS archives and facilitates the distribution of data from NASA's unmanned planetary spacecraft. With the exception of the New Horizons images, images are archived in IMG format. This format is not supported by most photo editing software, like Photoshop, but these images can be accessed using various freeware programs available online. One tool I recommend is IMG2PNG, created by Bjorn Jonsson. This converts IMG and FITS images into PNG files (even 16-bit files if the original images require it). IMG2PNG will even calibrate Cassini images. You can then mess around with those PNG files in Photoshop or GIMP. The PDS Rings discipline has a search form for Voyager 1 and 2 images located on their website. From this form, you can search for Io images by spacecraft, camera, filter, and exposure time. The main annoyance is that the search only displays 10 records at a time if you choose to view preview gifs with each record, which really helps you find the image you are looking. You have to back out to the search page and put a number into the Skip field to go to a certain number record, if you display preview gifs. Also make sure you set the listing type to detailed, under Query Options on the search page if you intend to download the raw images. The images themselves can be downloaded by clicking on the links ending in IMQ for the image. The PDS Imaging Node hosts a search form for Galileo raw images. This form allows you to search for Io images by orbit as well as access NIMS cubes. If you want to download Io images, be sure to select GO-J/JSA-SSI-2-REDR-V1.0 as the dataset ID. The results pages are a little more intuitive than the Voyager page. Each images comes with its own separate page where you can download the image and look at various label information regarding that particular image. Just click on the "Download Full Resolution File" link to access the raw image. The PDS Imaging Node also hosts a search form for Cassini raw images. This form is a bit more complicated, not to mention the fact that the Cassini data set also includes a number of Io images where Io isn't the target, Jupiter is. I do not have much experience with using the Cassini PDS site though this search doesn't seem to be as intuitive as the Galileo form. The PDS Small Bodies Nodes hosts the New Horizons raw images. This page is does not have a search form, so you can either download the entire dataset using wget or download each volume as a giant tarball. Different pages online such as the official New Horizons Science Operations Center or my Io New Horizons page can give you an idea as to which images are Io images in the dataset. In addition to these search pages, you also download the Galileo, Voyager, and Cassini datasets just as you would the New Horizons images, using wget.